A vest can add just the right amount of edge and sophistication to your ensemble. Stay stylish and comfortable at all times with Neiman Marcus’ vast selection of designer vests made with the choicest of luxurious fabrics. We offer a contemporary selection of vests in a variety of classic, sporty, elegant, and other captivating designs. From cool and relaxed reversible vests, puffer vests, and stand-collar vests to bold fur vests and cashmere vests, the collection has a solution for every season and occasion. High-style and functional ease define our collection of vests. You can easily browse our vests by designer name, color, and material, making it easy to look for the right vest. 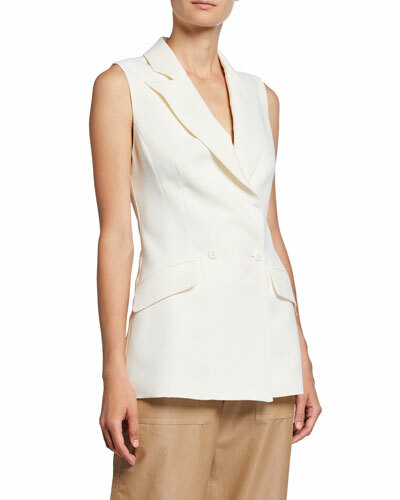 Shop Neiman Marcus for designer women’s vests in attractive designs. 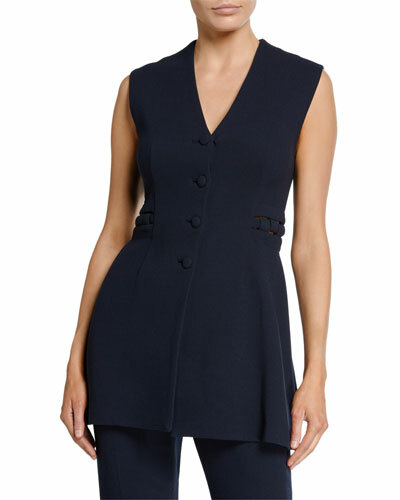 3.1 Phillip Lim vest in pinstriped stretch-wool suiting. Notched collar; wrap front. Adjustable contrast belt cinches cropped waist. Padded, raw-cut shoulders. Wool/spandex. Dry clean. Imported. Model's measurements: Height 5'10"/177cm, bust 31"/79cm, waist 24"/61cm, hips 34"/86cm, dress size US 0/2. Lela Rose pants in stretch-wool. Side hem button-placket. Sits at natural waist. Hidden side zip. Slim fit; straight legs. Ankle-length. Lela Rose pants in stretch-wool. Side hem button-placket. Sits at natural waist. Hidden side zip. Slim fit; straight legs. Ankle-length. Wool/nylon/spandex. Made in USA of Italian materials. Model's measurements: Height 5'10"/177cm, bust 33"/84cm, waist 25.6"/65.2cm, hips 35.8"/91cm, dress size US 2-4/FR 34-36.